Click for a better view. We’ve decided it’s time to move on from Space Food Truck content production, but I did have a solid head start on the artwork for what would have been our first expansion: the Resupply Remix. Basically all of the items would be removed from the game and replaced by totally new ones with different abilities. Sadly, these guys never made it to the beta testing phase. We also had some neat ideas for new character skins. that would not only change the way your Captain looks, they’d also change all of her class cards in the lab to new ones. 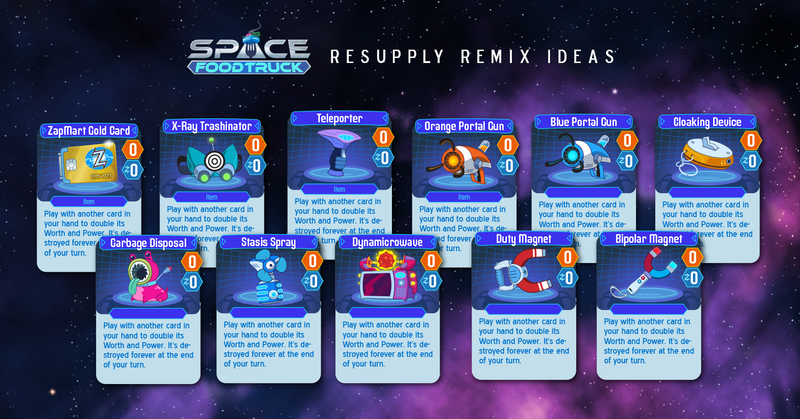 So between that and the resupply remix, you could play SFT all sorts of different ways. But alas, in the way that most of our games go, we never have time to add everything we want. We’re already off on our next adventure, Hex Gambit!